A weak system is currently moving out the southern plains towards the southeast. I mentioned yesterday how this southern system was going to swing out ahead of the northern stream system; missing the phase and leading to 2 minor events. This first system will eventually exit off the Carolina Coast where it will develop a weak low pressure center before scooting out to sea. There will be enough lift to the north of this system to produce an area of light snow. The latest 12z wrf-nmm shows light snow moving into far southwestern Virginia sometime after midnight and spreading northeast throughout the day. This will be a quick 4-6 hour shot at flurries and snow showers for most locations. While most areas may just see flakes fall without any accumulation, there will be some locations that see anywhere from a dusting to an inch, especially those that get under the more moderate bands. 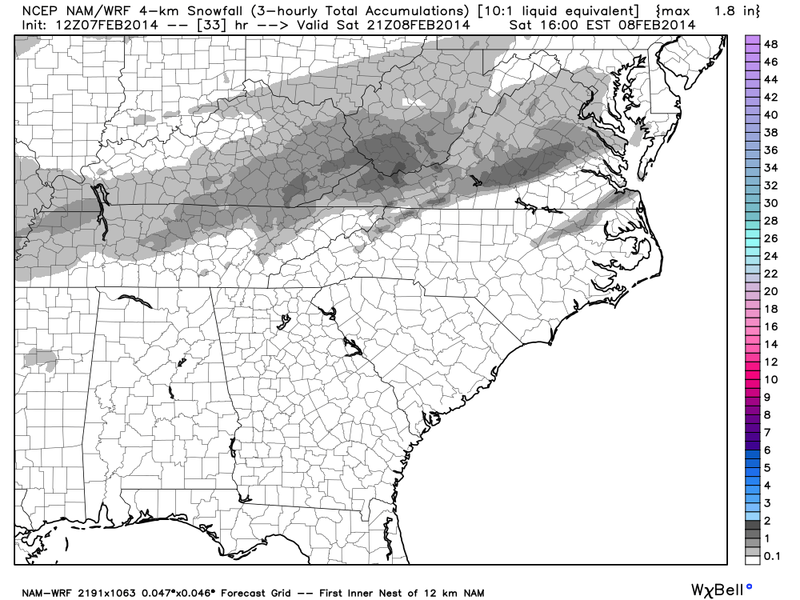 Here's the 12z 4km high resolution NAM total snow accumulation model forecast. The northern stream clipper will then move through during the day on Sunday. This may bring some flurries and snow showers to the western slopes and portions of northern Virginia. I don't expect much of any accumulation with this system either. Still keeping an eye on the early to middle part of next week.